Cocteau Twins-Four-Calendar Café and Milk and Kisses Vinyl. It was the best of times, it was the worst of times for 4AD President Ivo Watts-Russell when the Cocteau Twins released their sixth studio album Heaven Or Las Vegas on the ’17th’ of September 1990. He watched as the critically acclaimed album of dream reached number seven in the UK where it was certified silver. Across the Atlantic Heaven Or Las Vegas reached number ninety-nine in the US Billboard 200, as the album sold 250,000 copies worldwide. Heaven Or Las Vegas was one of 4AD’s best and most successful albums which was something to celebrate, but by then Ivo Watts-Russell knew the Cocteau Twins were about to sign to Fontana. After six albums, the Cocteau Twins whose music was starting to evolved, left 4AD on a high after their most successful album Heaven Or Las Vegas. It was the start of a new era for Liz Fraser, Robin Guthrie and Simon Raymonde who released two albums on Fontana, Four Calendar Café and Milk and Kisses. They’ve been reissued by UMC and are a welcome reminder of what was a new chapter for one of Scotland’s greatest groups of the last forty years. After the release of Heaven Or Las Vegas, all wasn’t well within the Cocteau Twins. Part of the problems was the conflict with 4AD founder Ivo Watts-Russell. It had gotten so bad that the Cocteau Twins were considering splitting up. To make matters worse, Robin Guthrie was in the throes of drug and alcohol addiction. Things were looking bleak for the Cocteau Twins. In 1991, the Cocteau Twins left 4AD and signed to Mercury Records’ imprint Fontana in. the UK This was a new start for the Cocteau Twins. They began recording their seventh album and Fontana debut Four-Calendar Café in early 1993. The album was a response to what the band had been through in the last few years. Robin Guthrie had entered rehab and was no longer addicted to drugs and alcohol. His partner Liz Fraser had undergone a course of psychotherapy, and the Cocteau Twins were a very different band. 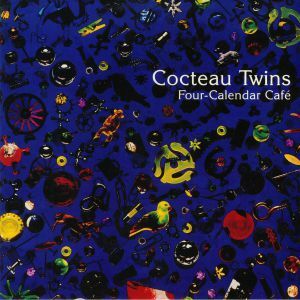 Four-Calendar Café was released to critical acclaim on 18 October 1993 and saw the Cocteau Twins move away from the ambient sound of previous albums to a pop-oriented sound. There was still Liz Fraser’s ethereal vocals and dream pop sound as Four-Calendar Café which reached thirteen in the UK, but failed to chart in American. This was a disappointment for the Cocteau Twins who tried a new approach. In December 1993 the Cocteau Twins returned with their Snow EP, and followed this up with the Bluebeard EP in January 1994. Nothing was heard of the Cocteau Twins for over a year. In September 1995 the Cocteau Twins released Otherness which was a tantalising taste of their eighth album Milk and Kisses. So was the single Tishbite which the Cocteau Twins released in March 1996. The same month, March 1996, the Cocteau Twins eighth album Milk and Kisses, and the reviews were mixed. Some critics hailed the album as a fitting followup Four-Calendar Café as the Cocteau Twins combined elements of dream pop with ambient and pop. It was a carefully crafted and vastly underrated album from the Cocteau Twins that stalled at seventeen in the UK and ninety-nine in the US Billboard 200. This was a huge boost to the Cocteau Twins as the Fontana years continued. Seven months later in October 1996 the Cocteau Twins released Violaine, which was the second single to be released from Milk and Kisses. Sadly, Violaine which features on Treasure Hiding: The Fontana Years was the Cocteau Twins last ever single to be released from a non-compilation album. Over the next two years, there was no sign of the Cocteau Twins starting work on a new album. Then in 1997 the Cocteau Twins decided to begin work on their ninth album. Their time in the studio was short-lived and the Cocteau Twins disbanded citing irreconcilable differences, which was partly due to the break-up of Robin Guthrie and Liz Fraser’s relationship. It was the end of an era and music fans were in mourning. At least the Cocteau Twins left behind a rich, innovative and truly timeless musical legacy including Four Calendar Café and Milk and Kisses, which was recorded during their Fontana Years. The highlight was 1993s critically acclaimed Four-Calendar Café while 1996s Milk and Kisses is an underrated hidden gem. Sadly, Milk and Kisses was the final chapter in the story of one of Scotland’s greatest groups of the Cocteau Twins the dream pop pioneers whose inimitable sound was part of the soundtrack during the eighties and nineties, and is a truly timeless reminder of one of the greatest Scottish groups of the last forty years. ← ON THE DETROIT BEAT! MOTOR CITY SOUL-UK STYLE 1963-1967.